Humphrey B. Bear, a character familiar to generations of Australians, is up for sale. 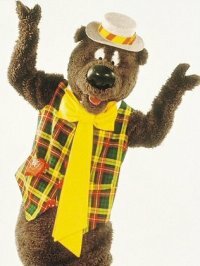 The mute brown bear, with his waistcoat, straw boater and yellow bowtie, first appeared on Australian television in 1965, and entertained pre-schoolers for decades. Over the years, the show Here's Humphrey won several Logie Awards, and Humphrey appeared on PBS in the United States. He was also given a special "Citizen of the Year" Award at the 1994 Australia Day celebrations. In 2009, however, Banksia Productions - which owns rights to the character - went into liquidation, and they're looking for buyers for Humphrey. The winning bidder will get four Humphrey B. Bear costumes, plus all intellectual property rights (including 1776 taped episodes of Here's Humphrey). You could try dropping these guys a line. Seems like more of a "don't call us, we'll call you" situation, though. The new owners have set up a website, but nothing on it so far, other than a phone number for appearances.